UNIVERSITY PARK, Texas — SMU’s "new" home for basketball is already generating new results. The Mustangs upset No. 17 Connecticut, 74-65, on Saturday in the first game in Moody Coliseum after $47 million in renovations were completed. It was SMU’s first win over a ranked team since a win at No. 17 Purdue on Dec. 21, 2003. The crowd of 7,166 was SMU’s first sellout since Nov. 20, 2001 against Texas Tech. 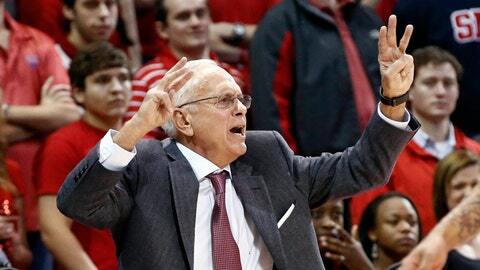 For an SMU program undergoing rapid improvement with Hall of Fame coach Larry Brown, it’s likely the first of many big games and big crowds in what’s been nicknamed "New Moody." "I’m just happy for them [the players] that they can play in an environment like this," Brown said. "We’re in a great league, got a great school, great cityâ¦I don’t look at any other program and think they have any more than us." The new and improved Moody has all-new seating and expanded concourses, a row of luxury suites at the top, and 23 video boards and an updated sound system. The project began with a $20 million gift from the Moody Foundation and demolition actually began before the end of last season. Brown said he was worried that the revamped arena wouldn’t be loud enough, but it didn’t take long for that worry to go away as the crowd of mostly red-clad supporters stayed energized throughout. Of course, it didn’t hurt that beer sales were also introduced Saturday at Moody, which opened in 1956. At halftime there were long lines at the beer stands, as well as for the men’s rooms. It also helps to have a good team, which SMU (11-3, 1-1 in The American) does, led by point guard Nic Moore who had 20 in his Moody debut. Nick Russell added 14 and Markus Kennedy had 10 points and 8 rebounds. Freshman Keith Frazier, SMU’s first McDonald’s All-American signee since Larry Johnson, excited the crowd with seven-point outburst early in the second half. SMU’s players got their first opportunity to practice in Moody just last week. Before moving back into their old digs, the Mustangs played six "home" games at the Culwell Center, an arena owned and operated by the Garland school district. "We’ve been waiting for this day. January 4th had been on our calendar," Russell said. "We were all excited, all jacked up." Brown’s NBA ties added to the Opening Night atmosphere, with NBA luminaries Dikembe Mutombo, Avery Johnson and New York Knicks coach Mike Woodson in attendance. More importantly to SMU, there was also a large group of top high school prospects in attendance. After the game, Brown grabbed a microphone and thanked the crowd for their support, including lead individual donor David Miller. Miller and his wife, Carolyn, contributed $10 million to the renovation, which included construction of the Miller Event Center on the north side of Moody. "There was no way this could happen without your faith and support," Brown told the crowd. "Have a Happy New Year, and I’m going to celebrate tonight with my family."